The "fridge" edition of the Edelweiss calendar has been updated to include a couple of added events. These are -- June 1, Schuhplattler Tanz with BSC Holzhacker Buam in Toledo (Siasswasser is playing! ); August 18 -- Club Picnic at Spindler Park. The May 18 Maifest with the Isartaler in Pittsburgh is a firm date now. Dance practice start time for non-meeting days has been changed to 11 am. Our email address has also changed. (If you use the "Contacts" on the website, you'll automatically get the right email address.) To download the 2019 schedule, click on the first item under "Newsletters" on the right hand column. Will it change again? Ha! What do you think? Read more about Irish? Bayrisch? Spend the Day with Us! Who's Going to Toledo on Funday, Feb. 24? OK, so it's really on Sunday, Feb. 24. But "Funday" is a much better description of what our Frühschoppen with the BSC Holzhacker Buam is all about. It starts off with a traditional Bavarian breakfast of Weisswurst, Weissbier, Brezen, and lots more great food at 11 am. After that, we'll be dancing Schuhplattler, Boarischer, and Volkstänze together. 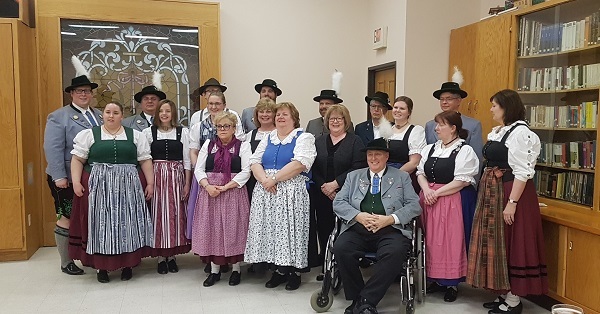 Our friends from Bavarian Club Chiemgau in Windsor will be along for the fun, too. Each club will teach the others a new dance. Of course, plenty of visiting with friends is a must. It'll be fun, so don't miss out! The day is at the Bavarian Sports Club Hall, a great place with reasonably priced drinks, a delicious breakfast, and a fun atmosphere. Read more about Who's Going to Toledo on Funday, Feb. 24? Our dance officers stayed the same with the exception of the secretary. Thank you, Janet Seefried, for filling that role so well the last couple of years! Welcome to Megan Lepkowski as our new secretary.